I’m from Argentina and I’d been using Mighty Gricery for two months. It’s a great App. I write to you because in my country is usual to get a general discount a the end of the account if you pay with credit card. Is posible add this discount in my list? Javier, thank you for your question. Unfortunately, list discounts are not available in Mighty Grocery yet, but we have plans to add them in one of the upcoming releases. Please let me know if you have any further questions or comments. When I change my units in the quantity the unit price doesn’t change. It stays in lbs and this is very confusing. How do I change this? Siobhan, thank you for your comment. Unfortunately, changing units for an item is not supposed to change unit price. You need to set unit price for that item manually. We may consider this feature going forward though. Please let me know if you have any further questions or comments. Thank you for your response. In the tutorial when you change the unit the unit price unit changes to the same. So if I bought oil in bulk from BJs and its in ounces and I put in 128 oz the unit price is given in lbs. This gets me confused. I know its right, because I did the math but I would love it to give it to me in per ounce since I am using ounces not lbs. Other wise I really love your app! Siobhan, thanks for the details. By default, unit price for weight in ounces will be presented in pounds. 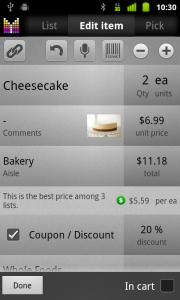 It is possible to change “base units” for ounces under Menu –> Settings –> Units –> tap Ounces –> base units –> Ounces. 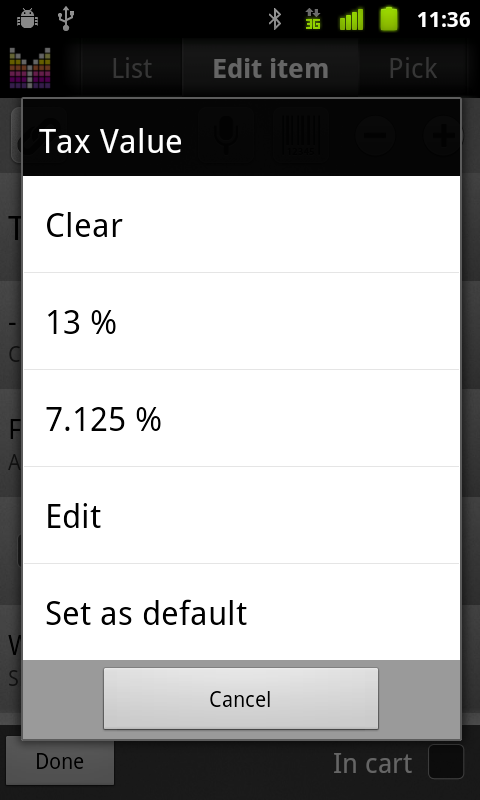 Then tap Base ratio –> enter  –> confirm. Please let me know if you need any further assistance. OMG thank you! I came across this issue just yesterday and was wishing there was a different way of doing things, I’m glad for this extra info. Thanks again. When I changed to using Samsung galaxy ii, when I check off an item on my list I no longer get a box allowing me to edit the price no longer automatically pops up. I have to first edit the item, enter the price and then cross it off the list. Can this be changed? If so, how i.e., check “in cart” box and a box pops up for me to confirm or edit a new price. Once I do that, I choose okay and the item automatically checks off into cart. Karen, please make sure that “Details mode” is ON under Menu –> Settings. Also you need to tap item’s checkbox rather than item row. Hopefully this helps. Can I not configure taxes on the line item (i.e. Potato Chips $3.99 only) and just have it show in the checkout line? I want to make sure that I am putting in the right price, but I don’t want to see the price + the tax. Amy, unfortunately price for an item in shopping list will include tax amount. We may consider adding a setting going forward so that tax amount will only be available at checkout. With regard to differentiating between how many units of something I may want to purchase and the manner in which something is sold ie. $/kg, what is the best way to handle the following situation and still maintain an accurate total cost. I want to purchase 3 peppers but they are sold by weight not per item? Thanks for your time. Miguel, the best way to put “3 ea” in comments field and keep correct weight in Qty field. This way the total price will be calculated correctly and the app will remind you to get 3 each. Please let me know if you have any further questions or comments. When editing an item, why can’t I change the shopping list field from any list to say Walmart or Buehler’s? Can I have a seperate pick list for each of my shopping lists? Hi Tara, thanks for your question. Kindly note that you cannot change shopping list for product items under Pick list. 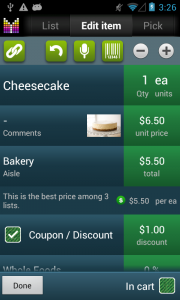 But you can change list for items in shopping lists. You might be interested in List-specific favorites feature to build separate “pick lists” for your shopping lists. Please explain the Discount option “Buy 1 Get x Free”. 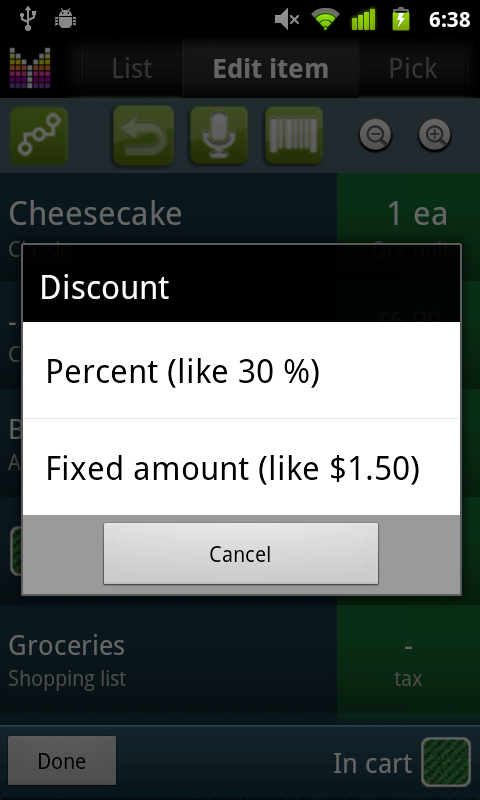 I purchased three items @ $1.29 each and got a fourth item free. How can I code this? Stan, technically, you can set “0.333333” for X in “Buy 1 Get X Free” formula. However, you will need to check manually that quantity is 4, 8, 12, etc. I think I missed a simple instruction re “changing quantities” of an item. For purposes of price comparison, I prefer to enter items in “Favorites” at the minimum packaged quantity (a 2-liter bottle, a 3-lb pkg, a 10-pack of juice boxes etc). Then, when building my current list, I choose items from Favorites. But if I want to buy 6 2-liter bottles of soda, using the Plus-Minus edit feature in the Quantity column changes the quantity in the Favorites list too. I just want a way to quickly say how many to buy today, without changing my Favorites. Nita, thank you for your feedback. Kindly note that changing quantities should not affect price compare results. Anyhow, if you don’t want Favorites Qty to change after changing Qty in shopping list, you’ll need to unlink Favorite item. To unlink item, just open Edit item tab –> tap link button in the upper-left corner –> Unlink. Thanks for the info on Unlinking. Since you don’t offer a “Pantry” function yet (to keep an inventory), I had hoped to use the “Favorites” list as the place to record all items I purchase regularly, noting how many I have in the Comments / Details section on each item. When an item is low, I can start a “Groceries” List quickly by looking into my Favorites and just tapping them to add the items into the Groceries List. **Now, after I have moved an item from Favorites into Groceries, I need to (in Groceries list) select item for editing; tap the Unlink icon; and type or use Plus key to change the Quantity — otherwise my Favorites list will show a new quantity as well? This should work… thanks. Why? In soft drinks aisles the price tags don’t stick with ‘per ounce’ pricing among liters, 16 oz, 8oz, 2-liter bottles — but in my Favorites list I can enter all bottle sizes and 6packs or 4packs whatever, using ounces, to quickly see which “sale prices” are good. BUT in my Groceries list, I don’t want “99 oz” as a Quantity — I want to know that I need 3 1-liter bottles of tonic water (for example). That’s what I am getting at. Nita, thanks for your response. First, you may want to unlink item under Favorties. You won’t need to do it in shopping list then. As for price compare, I see your point. Have you tried using “Compare units” for differently packaged items, as suggested in the User’s Guide? Well I got the aisle problem licked that I posted in another area by deleting then adding it again and then adding an item. Everything is working great so far and taking it for it’s first test run today. Seems I also had multiple aisles listed. Don’t know if that had anything to do with it but it’s working. Have another question. I have the full app and was wondering if I could also bring it over to my computer and enter items there then sync with kindle and load the kindle with the new additions? In another direction, could I connect to my computer and access the app then add items that way? Haven’t seen anything that mentions this and I can’t see you building such a great app on a cell. Me and my fat fingers would sure be happy if this was possible. You don’t have an app that takes care of vehicle maintance records the same way do you. Seems you could do a great job on something like that also. Please note that aisles will show up in the Pick list if they have any enclosed items. So just add an item in the new aisle and the aisle will be displayed in the Pick list. As for accessing shopping lists from your computer, it is possible to do using the My Mighty Grocery website which allows editing shared shopping lists online. Please see Sync with cloud User’s Guide for more details. Thanks for the idea for the app. We will give it a thought. Hi Alex! It’s been over a year since I’ve shown up on your message board! I’m still rocking your app and recommending it to every one of my friends. I’m mega embarrassed to ask this question but 20 minutes spent clicking on link after link here has not netted me the answer I need. I just know the answer is HERE, somewhere; I’m just not clicking on the right area, obviously. Okay, here’s the embarrassing question: HOW in the world do you delete an item from the Master Item List???? I’m talking about the giant list that drops down that holds every entry. I have tried every possible way of deleting mispelled or duplicate entries and have ended up with NOTHING!!!! Grrrrrrrr….this is so frustrating and it’s all my own fault so no one to blame but me. For instance, I initially entered the food “tator tots” to my lists. Then, months later, I entered “Ore Ida Onion Tator Tots”, as that’s the brand and variety that my kids enjoy. So, every time I enter “tots” BOTH entries pop up, when I only need one. I’ve also misspelled “Half & Half”, entering “Have & Half”, so I feel like the Village Idiot each time I read this entry. Hi Bee! It’s always a pleasure to hear from you! There are a few options you may want to choose from. First, go to Pick list tab –> expand parent aisle –> tap (>) next to a “bad” item –> uncheck “Show in Pick list and Search”. Second, go to More –> Search –> enter “bad” item name –> tap (>) next to a row with “Pick list” label in the bottom –> uncheck “Show in Pick list and Search”. Finally, — this is the “right way” but it may require lots of efforts — go to More –> Search –> enter “bad” item name –> repeatedly tap (>) next to each row in History, Favorites, etc –> set the correct item name. You may skip Pick list row as it will go away as soon as all “anchor” items in History and other lists are corrected. Please let me know if you need anything else. And I look forward to hearing from you again! Alex: IT WORKED! IT WORKED! IT WORKED!!!! Oh goodness, Alex, thank you SO much for walking me through how to delete my bogus items to unclog my master list! It took me a while to figure out how to do it, simply because you and I speak two different languages (tech vs. non-tech) but I finally noodled it out with my pea brain! I’ve printed out your directions so if this happens in the future, I can rectify it immediately. Many thanks for taking the time to respond back to me; your app, next to Pandora, are the ones I use every day of my life. With your permission, I’m posting the “Deleting Items for Dummies” instructions that I wrote out for myself. I had NO IDEA what you meant by “expand parent aisle”; it took me a bit of time to figure that out along with other suggestions. Below are my notes to myself; keep them up for others or delete them, it’s your choice. It feels good unclogging my master list. Simple pleasures bring simple delights. 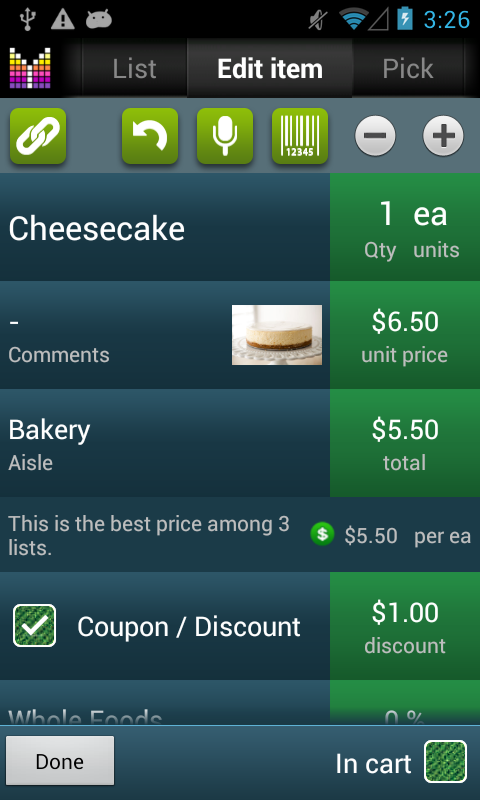 Open Mighty Grocery app. Touch main screen: select “Pick List”. Under “Pick List” will be the Aisle Headings such as Pet Food, Pharmacy, Fruits and Vegetables, etc. Touch the circle icon with the arrow pointing DOWN. This expands the items in that aisle. Go to the wrong entry. Long tap the item; a box will pop up that reads, “Edit” or “Delete”. Hit “Delete” and the item will be removed from ALL of the lists. Hit “EDIT” if you need to correct misspellings or want to add a brand name. When done, hit the circle with the ^ going up (next to the aisle name such as Fruits and Vegetables). This collapses the aisle items back to the original settings. Bee, thanks for your comments. I’ll keep them here as they may come handy. Thanks again! And don’t hesitate to contact me if you have any questions. You’re so welcome, Alex! And I hope my “Deleting for Dummies” can help some other person along the road. You know, we only “know what we know and don’t know what we don’t know.” As a landscaper, if I tell a client to “mulch their bed”, I forget that I’m using “Landscaper Talk” and my client has NO CLUE what I’m talking about! A “bed” to them is what you sleep upon. A “bed”, to me, means a planting area. Now, the word “mulch”…forgetaboutit! They haven’t a clue what mulch is and that there’s a zillion options for mulch. So, with your instructions to me, you were unknowingly speaking Tech Talk for Programers and I had to dumb it down. So glad that you didn’t mind my posting it. So far, everything about your app is working flawlessly. Next to Pandora, it’s the app I use most, every single day. Bless you for being so creative, inventive and patient with your followers. Thanks, Bee! It’s my pleasure!